The commercial quality Cybex 750C upright exercise bike is the only stationary bike on the market that offers the versatility of multiple modes of resistance, and a range up to 900 watts. The bright and large 10x15 LED displays time, distance, calories, calories/hr, METs, Watts, RPM, heart rate, and resistance level. With three modes of operation, the 750 C has 9 workouts with 21 levels including heart rate control with color-coded feedback of heart rate level. There are also 9 advanced programs and 9 custom programs. 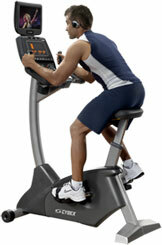 The Cybex 750C upright exercise bike is wireless HR monitoring compatible (chest strap not included). Constructed on a welded frame of forged steel, the Cybex 750C upright exercise bike features a hybrid Eddy current brake with brushless internal generator for low drag and high power capability, a double step-up drive system with self-tensioning idlers for minimal drag and low maintenance, and 165-mm 3-piece heavy-duty mountain bike crank on the pedals. The Cybex 750C is a self-powered unit that can accept an optional AC adapter for full time display. Other features of this upright exercise bike include multi-position contour handlebars providing riding positions from upright to aero, 2 sets of contact heart rate grips, extra-wide pedals with adjustable straps, and one-hand seat adjustment accessible from the riding position. 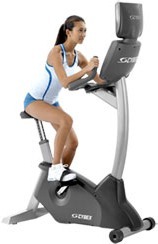 The Cybex 750C accepts an optional Personal Entertainment Monitor that is iPod compatible. In the three styles of resistance, you get the standard Constant Power, which is found on most bikes, plus a Bike Mode, which simulates outdoor cycling in that the resistance gets harder the faster you pedal. In Isokenetic Mode, the user maintains RPMs while the bike keeps resistance at a set level. This third mode works best for HIIT (high intensity interval training) as well as rehabilitation training. This is the same upright exercise bike that is sold to health clubs and rehab clinics for heavy use by multiple users every day. If it can hold up in those situations, it will serve you flawlessly in your own home, serving users of different sizes, weights, and fitness goals. The Cybex 750C has such a wide range of resistance it can be used by out-of-shape users, persons needing rehab, or even by the most elite athletes for intense training. With a resistance range of 20 watts to 900 watts, the Cybex 750C upright exercise bike is a phenomenal piece of home cardio equipment.